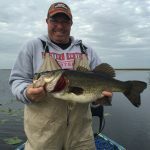 The start of this week on Lake Okeechobee was very good. The water warmed up to the mid to high 60’s but the winds were up in the middle of the week. This week was the new moon and this weekend the big fish moved in. The water clarity on the East side of the lake is muddy on the outside grass line but cleans up in the inside. The North end is good, as is the West end of the lake. This week the best bait is still shiners but on the artificial side Senkos and Flukes on the grass flats and Flipping a Craw worm in the Cattails has worked well. Good areas to fish are Kings Bar, Grassy Island, Tin House and the Lakeport area of the lake. Here is a picture James Bo Ward with the biggest fish he has ever caught. He was fishing with me this weekend.